C 72094 9 x resin parts & 1 x vac-form canopy. The Mirage F.1 came about from the search for a Mirage III replacement by the Armée de l’Air. A lot of consideration had been given to VTOL, swing-wing and larger two-seat designs with turbofans. But in the end a more budget-conscious solution was adopted as the Mirage F.1. This used the Mirage III fuselage, a slightly more powerful version of the III’s engine, but dropped the pure delta for a conventional wing and tail arrangement. This layout improved take off, landing, manoeuvrability, and range when compared to the Mirage III, and all at an attractive price. The design also appealed to previous operators of the Mirage III & 5 for similar reasons that it did to the French. Consequently the Mirage F.1 has enjoyed some significant export successes. 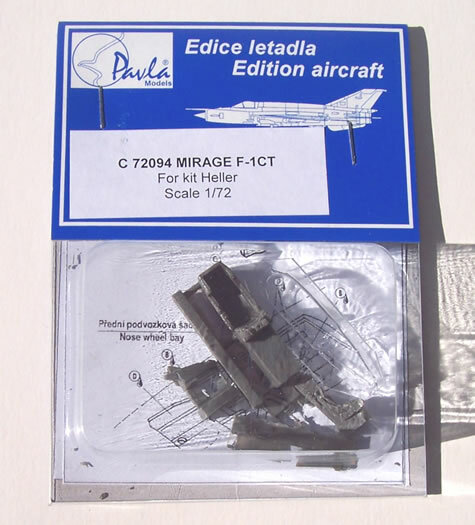 I’m aware of four Mirage F.1 kits in 1/72 from Airfix, Hasegawa (I think also re-boxed by Revell), Heller and Esci (I think that this last kit was almost certainly boxed by AMT/Ertl as well). 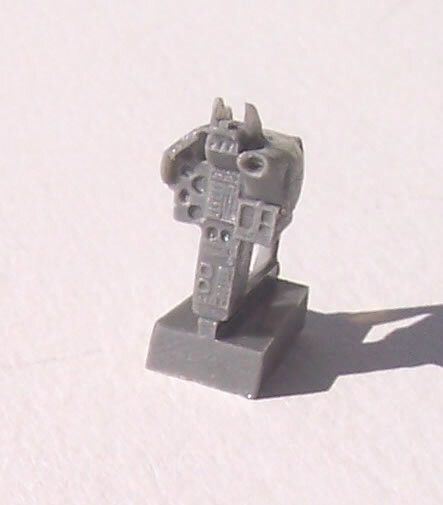 The first three all have fine raised detail whereas the Esci kit was engraved, but I think the least accurate. Italeri seem to now own many Esci’s moulds, but I don’t think they have has re-issued this one. 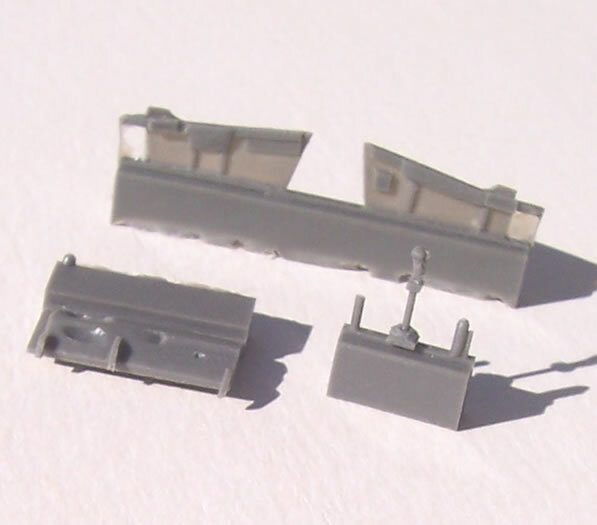 Pavla are well for their extensive range of resin seats, detail and conversion sets, vac-from canopies, and fairly large range of limited run styrene aircraft kits. They have adopted a sensible and welcome approach to aircraft accessories by frequently offering different degrees of enhancement for the same kit. 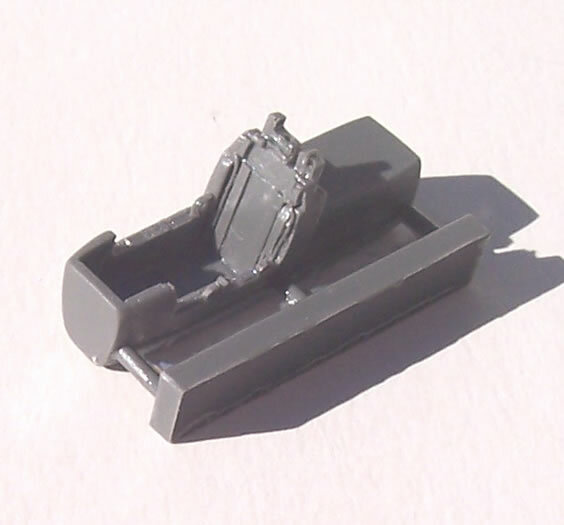 This is the case here with the option of full cockpit set and canopy, or just an ejector seat and or canopy. 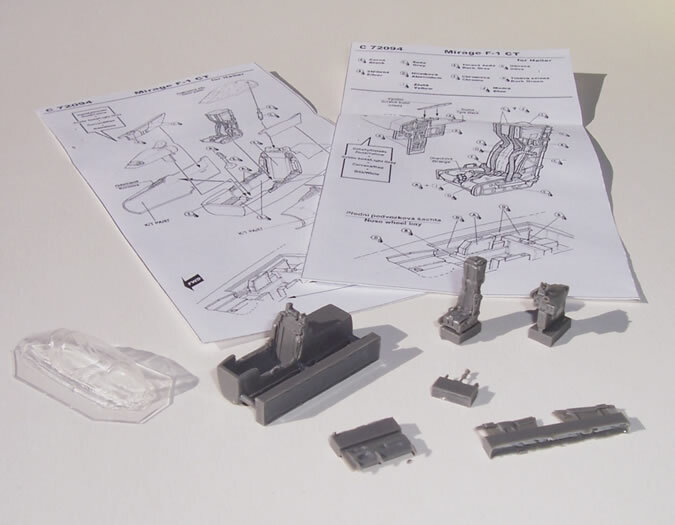 They also offer a cockpit set for the Mirage F.1C. 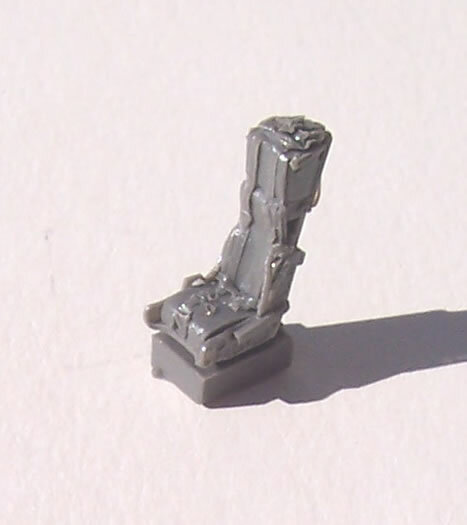 All of the resin is cast to high standards, with some very fine detail evident Clear instructions with paint call-outs area welcome feature of Pavla cockpit sets. The photos in many ways serve best to review accessory parts, but a few two things worth mentioning are nicely done radar scope visor delicate buckles. There also a bonus in that a new and presumably more detailed nose undercarriage door. The canopy is flawless and will allow everything to be shown off to full effect. If you’re on a budget, or need so much detail, you can buy just the seat and/or canopy separately. The set reviewed here is intended for the Heller kit, although no doubt can be adapted to the others. However it is likely that the canopy will be the least readily adaptable component. 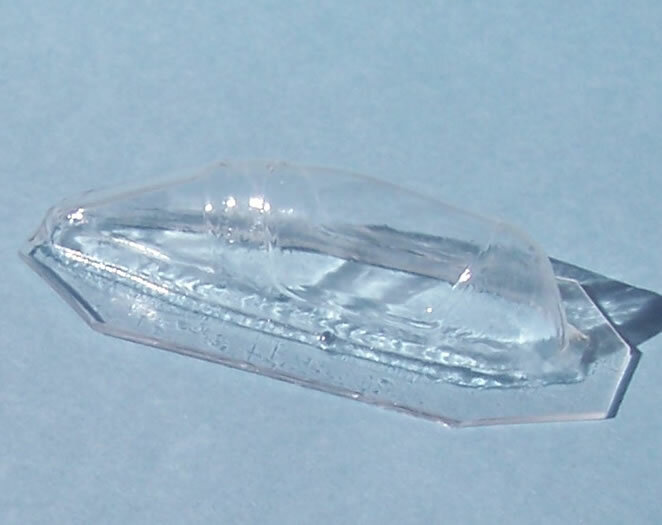 I used to own all four brands of 1/72 F.1 kit mentioned earlier, but now have none of them. So regrettably I can’t comment on this set’s suitability for the brands other than Heller. I can say however that all four of them could do with a jolly-up in the cockpit department, so this set is very welcome.